In one week’s time Myth Ink Books will be vendors at the C2D1 Haunting 30th Anniversary Paranormal Symposium. We will have all of our titles available, plus a selection of used books and products geared toward the paranormal community. Many thanks to Christopher DiCesare, Bill WIlliams and event sponsor CITA Productions for this opportunity. Read all about the Symposium below. Back in the winter of 1985 a dozen college students living in Erie Hall were terrorized by an extreme haunting. Lasting for several months, students eventually knew to stay away from room C2D1 where a full-bodied apparition was sighted and photographed, strange disembodied voices were heard (that were eventually recorded) and moving objects witnessed. What makes this extreme haunting particularly compelling and unique is not just the duration (it lasted for several months) but its extreme intensity: the large number of credible witnesses (including a priest, a college professor, and several parents), the vicious physical attacks and the amount of surviving historical evidence. 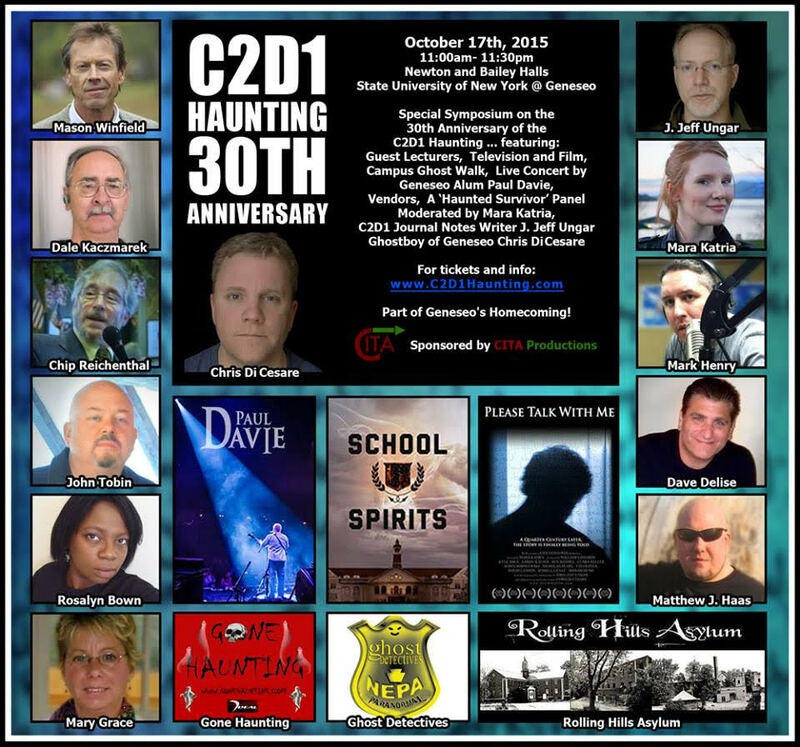 On Saturday, October 17th, 2015 at SUNY Geneseo, in beautiful Geneseo NY, the paranormal symposium is occurring to explore the C2D1 haunting and honor the survivors at the exact location where it occurred! There will be a vendor area, live musical concert by Mr. Paul Davie; a never before seen in public version of the hit SyFy School Spirits: Dorm Room Nightmare episode; an unprecedented haunted survivor panel; six unique professional lectures focusing on aspects of the C2D1 Haunting; and a keynote address by author, Mr. Christopher Di Cesare, the ‘Ghost Boy of Geneseo’ as seen on SyFy and heard on Coast to Coast AM. And for those brave adventurers, the event will end with a campus ghost walk led by Mr. Christopher Di Cesare and John Jeff Ungar. The legend of the C2D1 Haunting has grown over the past 30 years and is now internationally known. This once-in-a-lifetime event is part of the college’s Homecoming Weekend. There will be NO charge to attend and there are no tickets as seating will be on a first come basis. The event is open to students, alumni as well as the general public. Cannot attend the Symposium? Want to know more of the CD21 Haunting? DiCesare’s view of life was forever changed by a series of horrifying events in and around his dorm room: C2D1 of Erie Hall. From early February through late April of 1985, he and his college friends would endure what is now called The C2D1 Haunting. Apparitions sighted, strange voices heard, moving objects witnessed and physical attacks all became part of the ordeal shared by Chris – who quickly became the focal point of the haunting. After years of avoiding the spotlight, in 2009 DiCesare – convinced by the level of respect and authenticity provided by the Please, talk with me film project – finally agreed to share his story. The film recreates the 1985 events surrounding the photograph that has become known across the internet as the ‘C2D1 ghost’. Featured on the SyFy channel’s show School Spirits. Please, talk with me premiered at SCARE-A-CUSE on September 14th, 2012 along with a companion book by the Rev. Tim Shaw. Surviving Evidence presents the most in depth look at the legendary C2D1 Haunting from the person at its center. DiCesare details the often extreme reactions — both positive and negative — that he and his fellow college mates experienced due to strange events that they were not prepared for. This memoir raises as many questions as it tries to answer. Historic relevancy, individual morality and the application of the paranormal experience in relation to free will are all deftly addressed in the context of the ten-week haunting by the person who witnessed it first-hand … and survived it.